Motivating financial prospects to become clients is a very challenging task and financial services understand it better. As a result most of these finance professionals are resorting to the idea of thoughtful marketing through custom finance notepads. Why? It is the only investment which is never going to fail and will offer them lots of benefits in the long run! 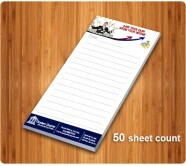 Promotional finance notepads can be used as business favors by finance professionals such as accountants, bankers, CPA, economists, venture capitalists and investment bankers.